Stools in four fun colors are great for the studio, office, or dorm room. 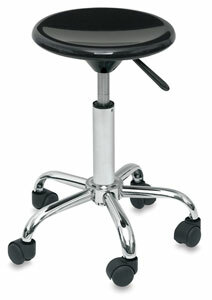 The 13" (33 cm) diameter contoured plastic seat has a glossy finish. 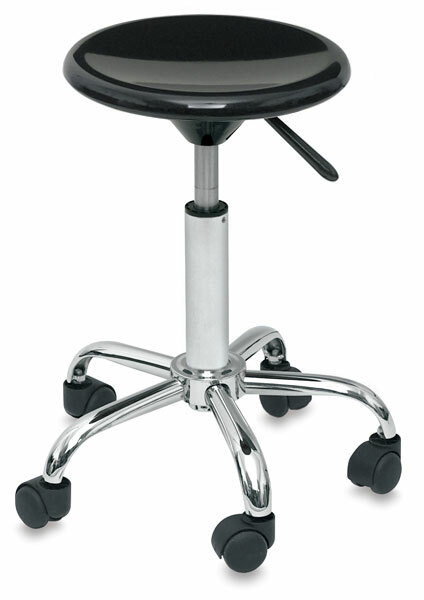 A lever underneath the seat pneumatically adjusts the height of the stool from 19" to 22" (48 cm to 56 cm). A sturdy steel five-star base features smooth-rolling covered casters. There is minor assembly required. In order to make the pneumatic feature work properly, before attempting to snap on the seat, push the white button on the base so the neck pops up and engages the pneumatic assembly. Then snap the seat down on the base firmly.